Come and join us for VIVALDI GLORIA! 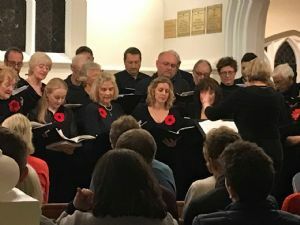 The Pirbright Singers will be performing the popular and powerful Vivaldi Gloria on Saturday 16th March at 7.30pm in St. Michael & All Angels Church and will be joined by guest soloists and performers for an evening of exciting classical music. We will be raising funds for the Tree of Hope charity that helps children and young people with a disability or illness. Tickets on the door, £10 adults and £5 children, and will include a glass of Italian wine and nibbles. Plant Sale Saturday 11th May 11am - 2pm, St Michael and All Angels Church, Pirbright. Perennials, annuals, hanging baskets and vegetable plants, all hone grown. Also a cake stall, sausage sizzle and a garden bric a brac stall. Garden Walks Saturday 11th May and Sunday 12th May 1pm - 4pm. We have 10 gardens for you to visit this year and have spread the event over 2 days, to give you more time to visit every open garden. We will also be selling cream teas back at the church room, on both Saturday and Sunday 1-4pm. Tickets for Garden Walks can be purchased from Helen Whitworth helenwelliewhitworth@btinternet.com, or get you ticket at the Plant Sale on Saturday 11th May at Pirbright Church.